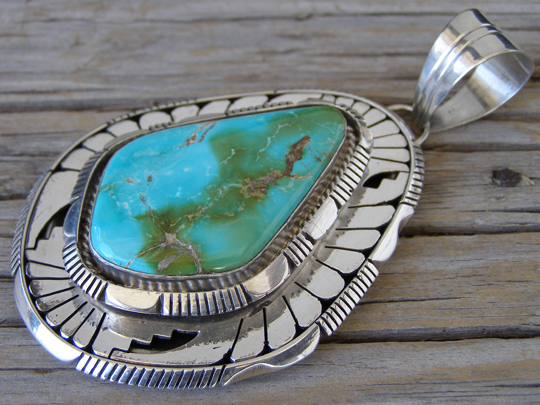 Elouise Kee is a gifted Navajo silversmith who does fine saw and file work in executing her original designs. she uses fine natural turquoise in her work. This large pendant is set with a thick stone of two-tone blue and green natural Royston turquoise from Nevada. The stone is set in a smooth bezel wrapped with twist wire within a raised shadowbox that has a saw and filework border. Cut-out work of the larger border illustrates stylized eagle feathers and kiva steps. The stone is even more perfect than it seems here in our pictures. Elouise added a large bale to this pendant and it begs to be strung on a strand of large handmade Sterling beads as shown in the fourth photo (beads not included). Hallmarked Elouise Kee and stamped Sterling on back. Stone: 1 3/4" x 1 1/8"
Dimensions of pendant (excluding bale & jump ring): 2 3/4" x 2 1/8"
Opening of bale: 14 mm.